An understanding of basic science is crucial for physicians who treat heart rhythm disorders. This issue summarizes the basic science of arrhythmias, including both acquired and inherited heart rhythm disorders. The basic mechanisms of arrhythmia are reviewed as are the mechanisms of atrial fibrillation. 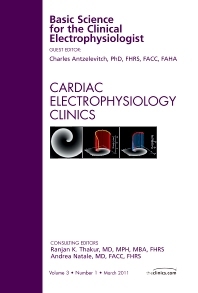 The issue is an excellent refresher for practicing cardiac electrophysiologists as well as a helpful resource for residents and fellows.